ABU & The 7 Marvels – Back in Stock! I am happy to announce that I just received a fresh box of Abu & The 7 Marvels, Richard Matheson‘s only children’s book! For those of you not familiar with Richard’s name, Matheson’s writing credits include 16 of the best Rod Serling Twilight Zone episodes, Steven Spielberg‘s first film (Duel), Somewhere In Time, The Incredible Shrinking Man, What Dreams May Come, I Am Legend, The Night Stalker and Trilogy of Terror. 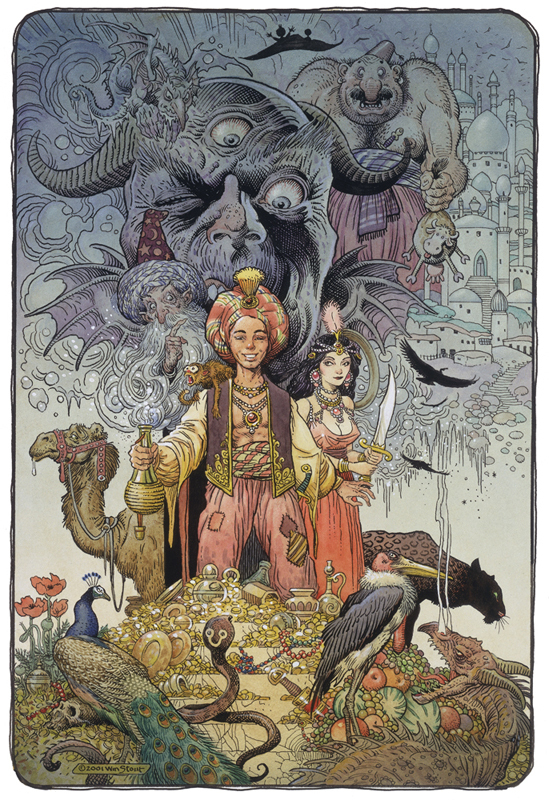 ABU won a Bram Stoker Award and was a Chesley Award nominee; it won the 2003 Benjamin Franklin Award for Juvenile Fiction and Gold and Silver Medals from the Society of Illustrators of Los Angeles. Hardcover; 8 full page full color illustrations; 19 black & white illustrations; 135 pp. EACH COPY IS SIGNED BY STOUT AND INCLUDES A SMALL SKETCH! This entry was posted on Tuesday, December 20th, 2016 at 11:23 am	and is filed under Misc.. You can follow any responses to this entry through the RSS 2.0 feed. You can leave a response, or trackback from your own site. Behemoth art that appeared in the new Spectrum collection. I’d really like to get a better look at that. Will it be in your next Willis O’Brien book? Great idea, Aaron — I hadn’t thought of that. I believe that I did use The Ginormous Behemoth poster in my last Monsters Sketchbook (#5), though. Definitely an amazing set of illustrations!